Our ski vacation at Mount Washington Alpine Resort was massively enhanced by spending a couple nights directly on the mountain. Minutes from the chairlift has some huge advantages. I owe a big thanks to my parents for bringing us on family ski trips. Just like your kids I’m sure… I had NO IDEA. 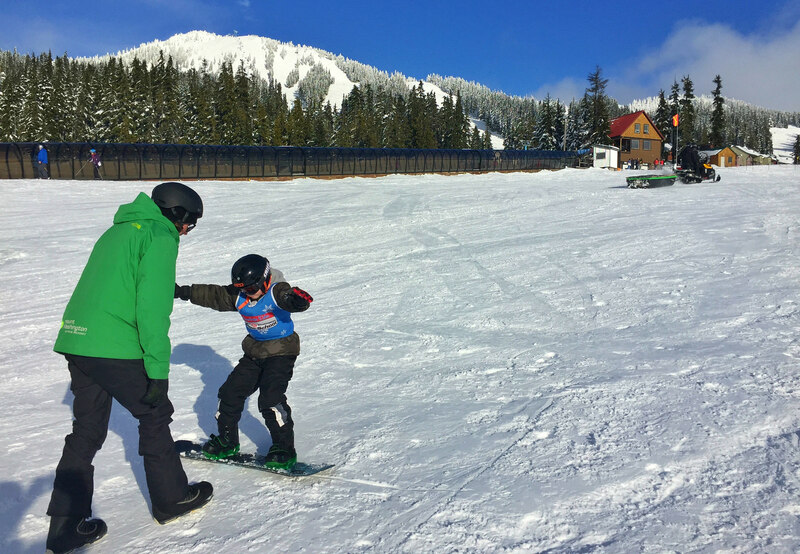 Ski trips are expensive and they take a lot of effort, especially for a non-skiing and boarding family. I thought for sure I would never be able to give my kids the same ski adventures I had as a child. That is, until Mount Washington on Vancouver Island invited us up for a family ski and boarding vacation! I couldn’t believe it. Us, the Traveling Islanders. A non-skiing and boarding family. Well at least the kids had never done it before. That all changed in three days on what became one of our biggest winter vacations yet. The trip was a 4-nighter, so we had to make an accommodation choice. 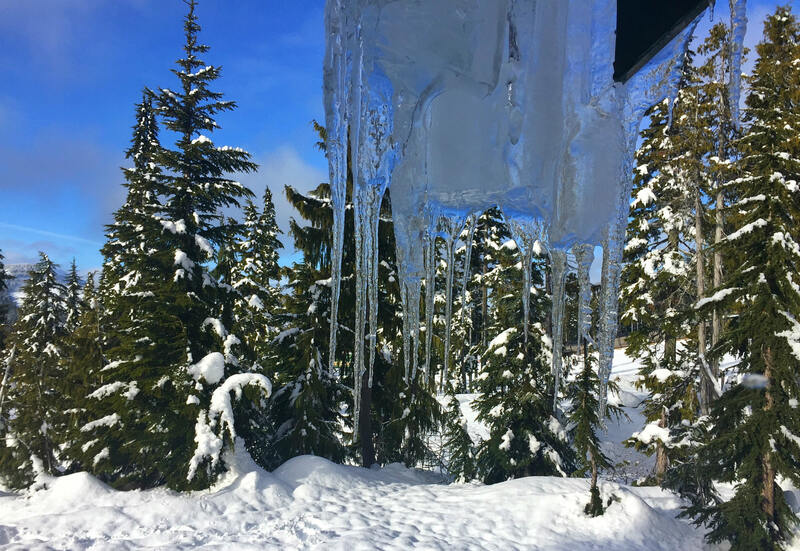 We decided to spend two nights in the Comox Valley and two nights directly on Mount Washington Alpine Ski Resort. And I mean directly on the mountain. We were so close to one of the ski runs we could walk there in 30 seconds! Unless it just snowed and then we had to swim through a sea of white powder for 30 minutes when we tried to cut through the forest, ha! Or better yet, it was just a one-minute ski to the chairlift. Staying at the Wintergreen Lodge on Mount Washington was a dream come true. Park The Car. Let It Snow And Bury You In. You Are Staying. There is one huge advantage to staying on the ski hill. You are set up and good to go. No worrying about traveling up and down the mountain, no carrying ski equipment to and from. Your family is safe and sound and relaxed. The euphoric feeling you receive from having a place to call your own on the ski hill is well worth the extra dollars. It makes everything better. What About Breakfast? Lunch? Dinner? And Second Breakfast? No problem just ski to your lodge, walk in and open the fridge. It’s that simple. If you get separated on the ski hill, just set a meeting time and reconnect in your living room. There was a code on our door, so we had no worries about keys. With a ski hill right out your door, everything is easier. There are no worries about where to put your stuff or how to cook your food. Everything goes faster too and that means more time having fun on the mountain. In the morning the kids were up before us eating breakfast and all their stuff was laying out on the floor in front of the fireplace or on hooks ready to go. Having a permanent home to kick back in and spread out for the whole of your vacation is ideal when travelling with kids. After a fun-filled day on the slopes, one of our favourite reconnect points was the hot tub. The view was incredible most days with the peaks off in the distance and the white fresh powder all around us. We just had to step out onto our second story deck and there sat our private hot tub in all its glory. 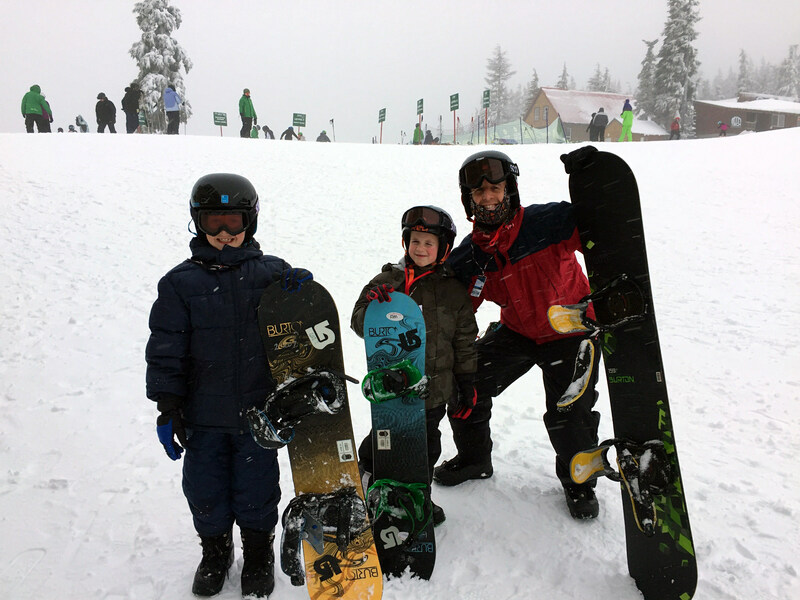 We had so much fun splashing around and talking about our day as a family…not to mention how good the hot water and jets felt after a day of boarding. When we first arrived we forgot our kids were islanders! They just wanted to play, roll, slide, and throw snow. Skiing and boarding wasn’t even on the top of their list of things to do when we opened the van door. Our kids love snow because they never see it. I know, it’s a strange concept to the rest of Canada that lives in snow all winter long. 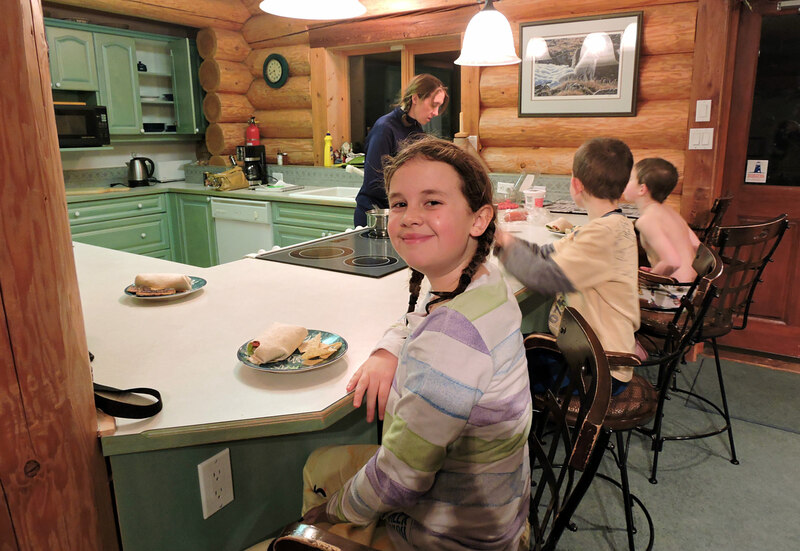 With our accommodation being a ski lodge directly on the mountain, our kids were free to play and eat snow until their heart’s content. Our day had a whole second part to it after the chairlifts closed. They just had to be reminded to watch out for the yellow snow! That ain’t a good flavour. 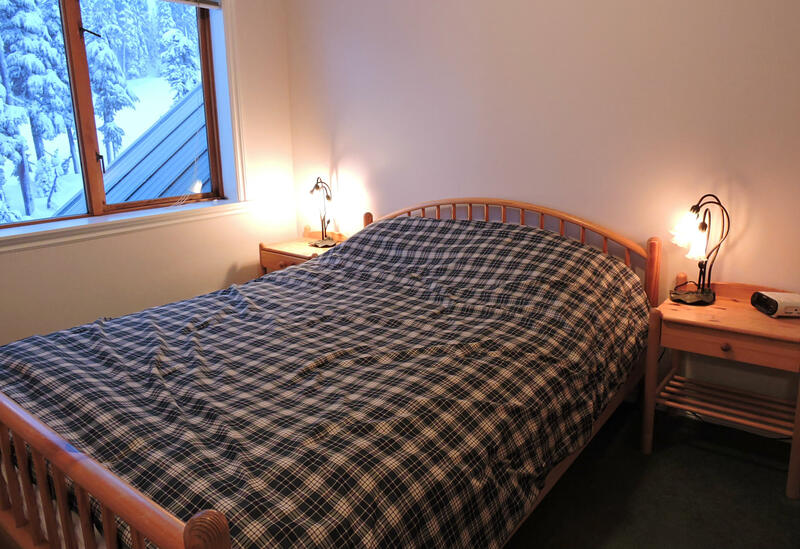 Our custom log ski chalet was 4 bedrooms, complete with queen size beds, bunk beds, two bathrooms, a full kitchen, two balconies and LOTS of hang out space. To say we had more than enough room is an understatement. There were so many rooms we actually didn’t even use one of them. 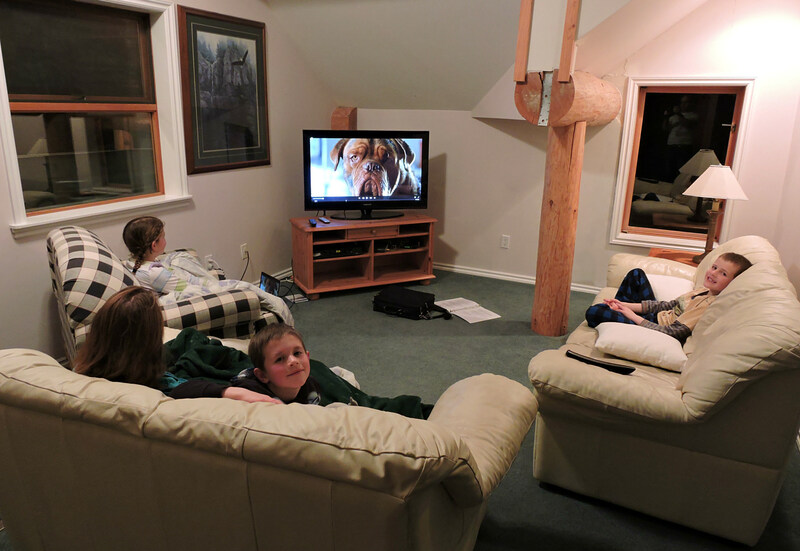 But when you’re invited by the owner to experience the best of a family ski stay on Mount Washington, you don’t turn them down. This would be the perfect accommodation for an extended family getaway or if you have some close friends who like to vacation like you do. Share the cost and save some money. It could put the lodge in reach for everyone. 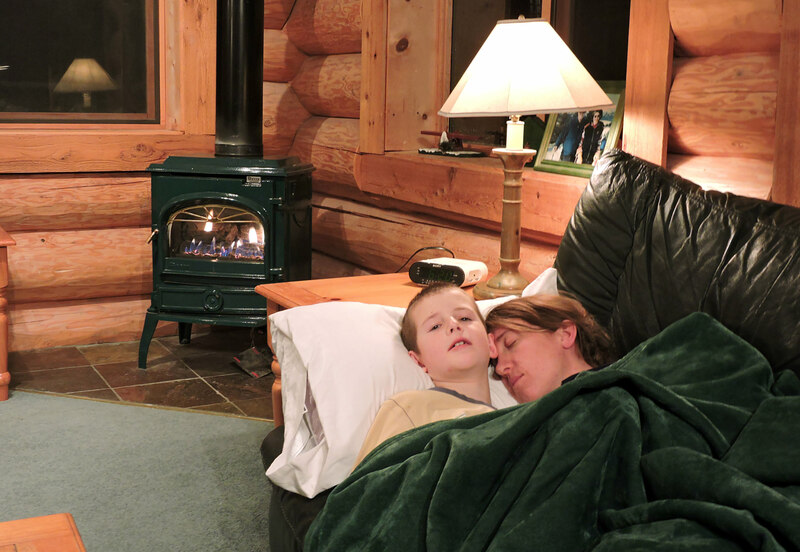 If you are looking for a smaller accommodation choice, Wintergreen Lodge has you covered. The unit below the one we stayed at is a two bedroom, and still has all the amenities of the larger one including a BBQ on the deck and a hot-tub. One down-side is that the windows will most likely be covered in snow. But then again, that could be a good thing too! It Can Be A Little More Pricey, But It’s The Best Accommodation Choice If You Can Afford It. Yes, it will cost more to stay on the mountain. However, you have to weigh out the pros and cons. Pro: Save money on fuel driving up and down the mountain Con: I’m stumped. Pro: You get to the park the car, save time and relax more. Con: Sorry can’t think of one. Pro: Save money on dining out with your mountain lodge kitchen Con: Ah! Got one! You don’t get to experience the diverse restaurant scene of the Comox Valley. All that to say… if we can afford it, our next time we will be staying on the mountain the whole time if it’s an extended ski vacation. The peace you experience. The private space to call your own anytime you want, the extra time to be with loved ones, the scenery… it’s hard to resist. Although, our kids may beg me to take them back to the swirly whirly slide at the Holiday Inn in Courtney where we stayed. Cost: Per night for the upper 4 bedroom unit is in the range of $500 – $765. 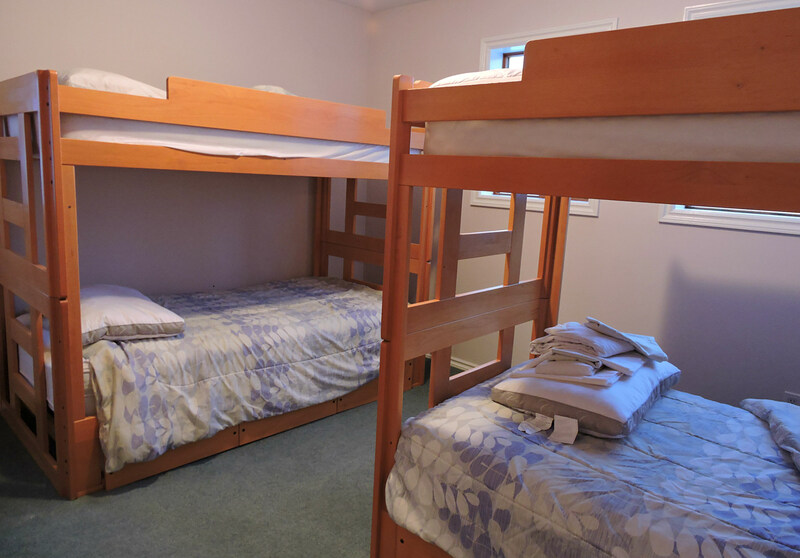 The cost for the lower 2 bedroom unit is in the range of $277 – $350 per night. Are you more the kind of person who would rather own your own ski lodge? You’re in luck! We noticed a for sale sign in the window and discovered it is only a cool $788,000. Previous postAvenue Bistro Upscale Casual Dining In Comox Valley Next postMillion Dollar Quartet Is At The Chemainus Theatre!